The experience has had an ease about it that I didn’t feel last year. What a good reminder that, for just about anything, practice helps. In celebrations of Poetry Friday, I’m posting a few of my poems from the past week. Visit Heidi Mordhorst’s My Juicy Little Universe for links to more poetry and many reasons to get excited about MARCH. February 21: I wrote in response to the prompt: “Write a poem inspired by a favorite word or a word you find interesting.” I’ve always loved the sound of “petunia.” Plus, it’s fun to say. Try it. a fish eat fish world? in the indoor office space. the poet’s readings, joys, and woes. to the present time and place. to oblige with a walk. I hear the beat of drumming, rhythmic rising cross terrain. I glance and see no drummers drum—the sound comes from a train. Thank you visitors and friends of poetry! This entry was posted in Karin's poetry. Bookmark the permalink. Thanks for sharing these and congrats on writing poems all during February! I think my favorite is The Underwater Way. So true :). Karin, I enjoyed reading your various poems. Laura’s sound poem project was a great experience. I congratulate you for your persistence with writing. I have another challenge for you but this is only asking for one poem with an accompanying photo that describes a winter whispering. 1st invitation at =>http://beyondliteracylink.blogspot.com/2015/01/ringing-in-new-year-with-look-back-and.html and another piece about the global gallery on today’s post for Poetry Friday. I hope you are interested. Thank you Carol, for the comment and the invitation. I am in the San Francisco Bay Area in California where we are already well into early spring. That does create some interesting poetic possibilities to contemplate. Karin, readers would welcome different perspectives so give it a try. Carol, I got an idea I like, and wouldn’t you know it we have an overcast day and rain predicted tomorrow. (There really hasn’t been much of that!) It should clear up after that, and then I can get the right photo. I hope it’s not getting too late. Karin, are you ready to send me a poem and photo combination for the Winter Whisperings Gallery? Hi Carol, thanks for checking in. I sent it on March 12 and then you added the border which was such a nice accent. We corresponded about that by email on March 13. I thought that completed it. Do you need anything else from me? Correction: The correspondence about the border was via Twitter messages on March 15. We have communicated many different ways! Thanks very much, Myra! I’m glad you like that one. Thinking of those furry assistants fills my heart. Nice to get to know you, Karin! I loved “tuning in to color” with the petunias. I hope you’ll come and join in my MarCH CHallenge now and then. Thanks Heidi, nice to get to know you, too! I will certainly CHeck in with the CHallenge. Happy MarCH! “I need to go stop her.” That made me laugh. I do tend to remember the best parts. Thank you for note. Congratulations on finishing the month with many poems, Karin. I love that line “with a snap”, but also enjoyed the poet’s assistant-very fun to see another view. Glad to have seen some of your work on Laura’s site! Thank you, Linda. Good to see your work on Laura’s site, too. You were sure prolific there. That was a lot of satisfying fun. You have such talent. I loved all of your poems — each so different. So do you have another book coming out any time soon? Aw, thanks so much, Patricia. That means a lot to me as I really value your opinion. I’ve been struck by the variety, too. I usually start with a subject idea, and each lends itself to something different. I like the process of choosing the fitting forms and techniques. No new book soon, but many ideas in the works! Karin, I love your conclusion that practice helps! I actually love that word attached to art of any kind… not “work” but “practice.” It feels very in the moment, like anything can happen– and also, less pressure! I also love thinking about the tune of the petunia. Thank you for sharing these! Thanks, Irene. I like applying “practice” to all the arts too. I think because a piece of art can be so powerful sometimes we think that skill at art is absolute–either you have it or not, and forget that practice is a big factor and that artists put a lot of time into their practice. 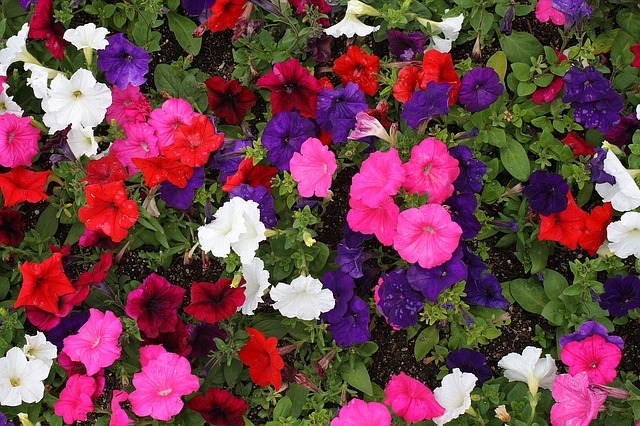 I’m delighted that you like thinking about the tune of petunias. Congratulations — way to reach that goal! I enjoyed all the poems you shared today…I think “Rolling Rhythm” was my favorite! Thanks so much, Tabatha! And I’m extra pleased that “Rolling Rhythm” was your favorite because now each of the poems has been someone’s favorite in the comments. I like that.